Follow the four steps to login and configure the Twitter data source. Opens up a browser window to login to Twitter, a Twitter account is required to view content. Once the login has been completed, a Pin will be provided, type it into the box provided. There are three Feed Types available: Search, HomeTimeline, UserTimeline and Favorites. Search will search Twitter for Tweets containing your chosen keywords, you can also enter in Hash tags and User Names. It is possible to search multiple hash tags or keywords at a time by using AND and OR (both in capital letters) between each keyword. 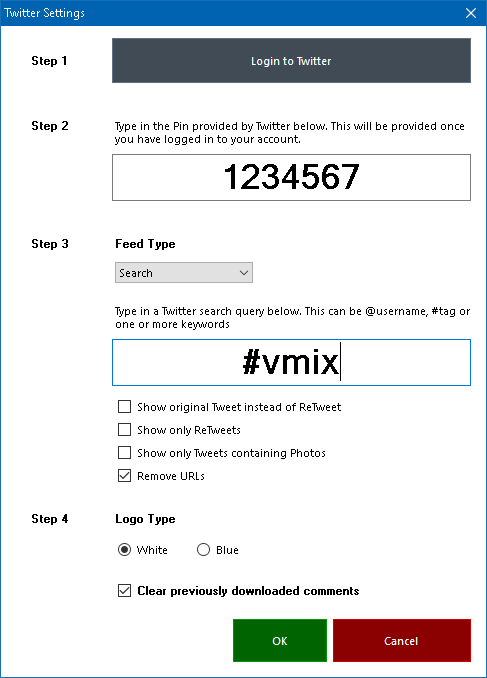 For example #vmix AND #4k will show all Tweets featuring both hash tags. Optionally the logo/icon to use as the Source in Data Mappings.